I am using 5V Arduino Nanos but any kind of 5V AVR based Arduino can be used. I have designated one of the Arduinos as the master device. This is the one that initiates the connection and in the first example it is the one that sends the commands. Having a master and slave setup makes the programming a little easier. To communicate with the BT modules I am using AltSoftSerial which uses pin 8 and pin 9. The AltSoftSerial library can be downloaded from https://www.pjrc.com/teensy/td_libs_AltSoftSerial.html and it will need to be added before you can compile the example sketches. Both BT modules are set with a communication baud rate of 9600. This can be changed but make sure you match the baud rate used when opening the software serial connection. Most HC-05s and HC-06s have 3.3v TX and RX pins. 5V Arduinos will read 3.3v as HIGH so the BT modules TX pin can be connected directly to the Arduino RX pin. However, the Arduino TX pin needs to be converted to 3.3v before connecting to the BT modules RX pin. A simple way to do this is by using a voltage divider made from 2 resistors; I generally use 1 x 1K and 1 x 2K. Both Arduinos have the same connections to the BT modules. 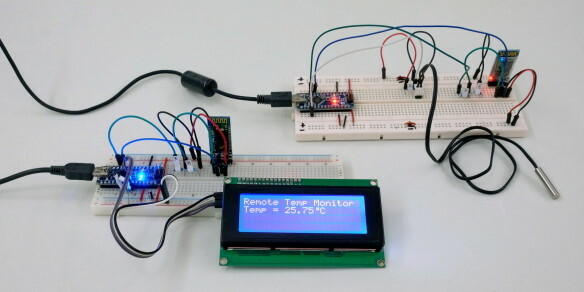 In the first example we get one Arduino to control an LED connected to a second Arduino. Communication is one way only and there is no error checking. Arduino #1 simply sends the commands LEDON and LEDOFF to the Arduino #2. When the Arduino #2 gets the commands it sets the LED accordingly. Arduino #1, the master device, just has the Bluetooth module. Arduino #2, the slave device we have the Bluetooth module and an LED (with a suitable resistor) on pin D3. The Sketch on Arduino #1, the master device connected to the HC-05, simply sends the command LEDON, waits a second, sends the commands LEDOFF waits another second and then repeats indefinitely. You will notice that the commands are contained within start and end markers, < and >. Using start and end markers allows the receiving device to check that it has a full command before acting upon it. The Sketch on Arduino #2, the slave device, checks for data and if there is a start marker it starts to put the recieved data in to the variable receivedChars[ ]. When an end marker is received it sets the newData flag to TRUE. Any data not within the start and end markers is ignored. When newData is TRUE we know we have a command to process. In this case we set pin D3 HIGH or LOW to turn the LED on or off. const byte maxDataLength = 20;          // maxDataLength is the maximum length allowed for received data. This example is a little more complex and unlike example 1, where the master device starts to send data as soon as it runs, this time it requests data from the slave. The slave receives the request from the master device and replies. The slave device waits until it it gets the “sendTemp” request, it then reads the value of the temperature sensor on pin A0, converts the value to degrees celsius and then sends it out as ascii via the software serial channel. The sketches use the same recvWithStartEndMarkers() function as before and so the data is wrapped in the < start marker and the > end marker. As before, the Bluetooth modules are set to automatically connect on start up. However, this time I an using 2 HC-05s; one in master mode, 1 in slave mode. On start up, the master device initialises the LCD and starts a timer. When the timer finishes it sends out a request for the temperature. The Timer is then reset. Within the main loop, the sketch is continuously checking for received data. When it receives a temperature it displays it on the LCD. The slave simply sits and waits for the request. When it receives the request it sends out the temperature and then goes back to waiting. The sketch on the master device is fairly simple. Once a second it sends a request to the slave device and waits for a reply. You can change the frequency of the request by changing the value of waitTime. There is no error checking or time out and the sketch does not know if it ever gets a reply or not. * AltSoftSerial uses D9 for TX and D8 for RX. While using AltSoftSerial D10 cannot be used for PWM. // If you don't have an LCD you can use the serial monitor. The slave device sketch is equally simple. It waits for a request, when it gets the request it sends out the current temperature. //  open a software serial connection to the Bluetooth module. i am using above code with arduino mega But its not working on the slave module ?? i am using build in led on Arduino mega at pin 13. so i changed the code accordingly. if i burn an empty code on both devices and start communicating. it transfer messages. i have linked both devices using AT+Link command ONly. On thre mega, use one of the extra hardware serial connections rather than AltSoftSerial. Have you had the two BT modules talking to each other manually? i am trying to have simultaneous communication between arduino via bluetooth. but it is not working. 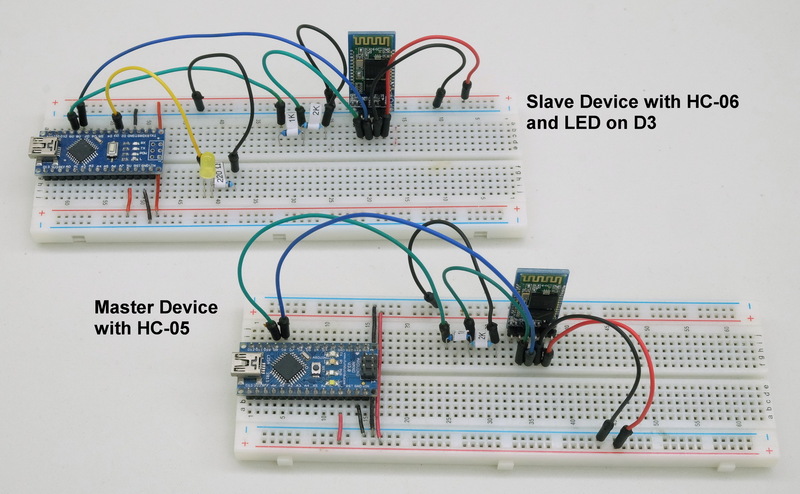 Start with the slave sketch, this has the code to receive data. Then add the send data part. So tried doing this to connect a nano(master) to an uno(slave). Everything is paired correctly and the master seems to be sending the signal from the serial monitor but the LED isn’t turning on. Any advice/help? Actually never mind. I managed to figure it out ! I can’t help with the MPU6050 but there are many guides online. I have added a second example which has 2 way communication between the Arduinos. How did you fix the problem? I am having the same issue. We are having the same problem. The bluetooths are paired correctly but the LED is not turning on. Please help us out as soon as possible! We are also having this problem. The Bluetooth modules are paired and the master (with the Nano) is sending the signal. The LED doesn’t turn on, though. Print the received data to the serial monitor. Make sure you are receiving the data and the data is what you think it is. Great tutorial! I haven’t messed with the Bluetooth modules much, but plan to soon as I have three hc-05 modules, and about to order three hc-06 modules to go with it. What I would like to do with them is incorporate them into a pixel poi setup. I’m building a POV poi setup with two teensy 3.2 controllers, because of the bigger flash memory. I was thinking that maybe I could use one teensy for one display and a trinket for the other display, connected to each other via Bluetooth, feeding the images from one to the other as images change. That way I can store all the images on one poi stick and not have to alter the other to sync with the first. Anyway it’s an idea, and if I can get it to work then it would make it possible to use a less expensive microcontroller for one display, and invest that money into a bigger flash memory. Also to be able to send other images via Bluetooth through a phone or other device would be awesome. Hi, I’m not very good at English. I can Connecting 2 Arduinos by Bluetooth using a HC-05 and a HC-06. I need help My project turn signal LED for bicycle. This my code ,need you more help code send Arduino to Arduino. I can’t help with the code and suggest you post on the arduino forum or the AVR forum. You will get lots of help there. instead of two “arduino nanos ” can i use two ” arduino unos ” ….? please let me know ….? For the examples above any 5V Arduino can be used without any changes. i have successfully configured both modules, and i can now turn-on and turn-off an LED wirelessly.. but my problem is, how can i control 4 LEDS?? is it possible?? hello. i was in search of this for past few weeks but finally found what i wanted. i am using master code on mega and slave on uno. however uno is not receiving any command. Can you please help? the two bluetooth modules are connected . Yes. You can use any device that can talk to the BT module by serial UART. POSITIVE was not declared in this scope. How to clear this error. You may have the wrong LCD library. The library I use is from https://bitbucket.org/fmalpartida/new-liquidcrystal/wiki/Home. Note you do not need to use the same one. You can use any but change the include and the initialization commands. It’s done inside the library. hi I have successfully uploaded the program for both master and slave ..but my BT modules are not getting paired each other. Can you let me know the chances of reason behind it. And if i want to do the pairing of BT modules with out using serial monitor should i go for “AT” Command method? Are you using the same BT modules as in the above example and did you go through the previous guide to pair and connect them? Easy to follow, nice level of detail, first time right. In your doc Arduino to Arduino by BlueTooth which uses HC-05’s and Hc06’s has this been updated to work with HM-10’s, or HC-12’s or even the nRf24l01’s. While my project is not dependent on one over the other, I would like to have as much distance as possible which I think would be the 12’s or rf24’s. Bluetooth Classic should have better range than BLE. I haven’t done a write up for the nRf24l01’s and haven’t tested using them over any kind of distance but others claim to get good range from them. I’ve tested my HM-10’s using code from the mentioned site, I don’t see much difference between that code and the code for the arduino to arduino you used with the two 05’s. What i’m wondering will the 05 code work with the 10’s. I have the slave code ready to go and will get the master ready to try later today at which time I’ll probably have the answer. Just thought you might save me the time or give me some pointers, if the code (can or could be ) modified to work with the 10’s. The sensor code is exactly what I need for my project. The HC-05, HC-06 and HM-10 are all serial/UART devices and have a serial interface that is used to talk to the Arduino. This means the Arduino code is basically the same for all modules. It would also be the same for any other serial device. The HC-06/05 are Bluetooth Classic and the HM-10 is BLE. The two are different and cannot talk to each other. After the modules are connected, either 2 BT Classic modules or 2 HM-10s, how you use them is exactly the same. I would like to automatically turn OFF the LED once my BT modules are out of range, could you please assist? I saw that you are using hm-5 and hm-6 for the bluetooth temperature sensor. If I want to implement hm-10, what do you think I have to take into account? Because the bluetooth that you have, one is master and the other one is slave, but the hm-10 are master/slave modules. hey there, is it possible to connect multiple slave BT modules to 1 Master BT module?